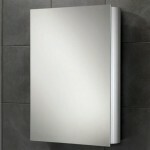 At Showers to You, we endeavour to offer industry leading products, without the industry leading price tag. We also know that renovating a bathroom is much harder than you first imagined and product placement isn’t quite as simple as it seems. Because of our long history and experienced team, we can help take these strains away and deliver a bathroom that caters for your unique needs. After all, no one person is the same and everyone is looking for their own little piece of luxury. Below we’ve given you a glace at what’s achievable with a little help from Showers to You. 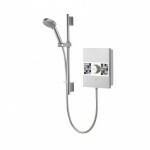 The Aqualisa Sassi 8.5kW Electric Shower with Harmony Head is a modern shower designed for the style conscious. In a bright white finish with subtle back detailing the Sassi range has a distinctive mosaic tiled panel meaning you can a pick the perfect colour to suit your bathroom or en suite. Practical too, with rub clean nozzles a clever delayed shutdown, meaning the last residue of soap water can be swilled away after leaving the shower, which also reduces limescale build-up. Also this shower has the Over Temperature Protection, practically eliminating scalding, meaning safety for all the family. This shower also comes with a full 2 Year Guarantee for peace of mind. £295.62 (Inc.VAT) Saving 22% off RRP. This April Prestige760mm Pivot Shower Door comes with 8mm toughened safety glass that has been treated with April’s Clean & Clear glass protection, the April 760mm pivot door features a contemporary bar handle, colour matched soft close door seals & concealed fixings. The door is fully reversible for a right or left hand opening & is available with the optional side panel to allow for a corner installation. £266.00 (Inc.VAT) Saving 30% off RRP. This 700 Square Shower Tray Low Profile Stone Resin creates the minimalistic look whilst being lighter than traditional Classic Stone Resin trays. 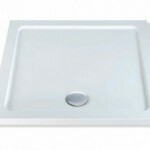 The tray is light enough to be carried and installed by one person and includes mineral anti torsion beams for extra rigidity, only 45mm in height and supplied complete with a chrome fast flow shower tray waste. £76.99 (inc.VAT) saving 27% off RRP. 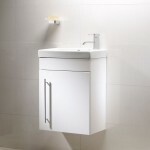 This Roper Rhodes Esta Wall Mounted Unit is finished in white and features a sleek and elegant design and because the Esta unit is only 460mm in width, it’s perfect for use within the cloakroom or small bathroom. £243.60 (Inc.VAT) saving 20% off RRP. This HIB Nitro aluminium cabinet features a double sided single mirror door and a mirrored back panel inside the cabinet, The Nitro cabinet is supplied with glass shelves that can be adjusted for personal preference creating plenty of storage within the cabinet. £164.00 (Inc.VAT) saving 36% off RRP. 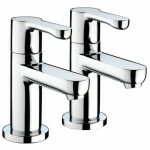 The Bristan Nero Basin Taps are easy to use & feature a stunning single lever handle, the Nero basin taps are supplied in pairs & are suitable for all plumbing systems. £62.00 (Inc.VAT) saving 45% off RRP. The Croydex Brompton Double Towel rail is a stunning product made from durable brass and stainless steel to create a solid construction, then finished in a high quality chrome finish. 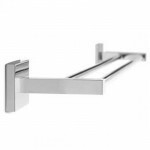 The Brompton double towel rail has a length of 674mm making it perfect for hanging large towels, this rail is supplied with concealed fixings to provide a clean and simple installation. £55.99 (Inc.VAT) saving 20% off RRP. The above design will give your bathroom a fresh new feel and what’s better; it’s achievable from just £1,164.20! For more information on how we can help you, or to purchase this design idea, call the team on 01472 2421509. In the meantime, please keep updated with Showers to You on Facebook and Twitter. For quality showers at low prices, it has to be Showers to You.